Pyramid has a roundwound that use the highest quality materials to give you a string with a smaller diameter core with a larger diameter outer nickel winding. Made by hand, these strings are exactly the opposite of common mass produced strings available today! The finishing touch of silk overwrap date back to the original tradition of their quality strings, applied by hand by skilled master string makers using a different color for each gauged set. For players that prefer roundwounds, these nickel strings set a new standard. They are heaven. Super feel, outstanding tone, with exceptional timbre. 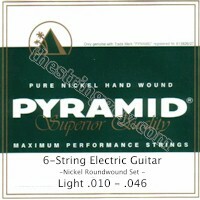 Pyramid Maximum Performance Roundwound Strings sing!